At heart of our work at Earo is to design speakers that are suitably impedance matched to the air. Our white paper dives into more detail on this subject than I´ll do in this posting, what I wish to cast some light on is one particular case where poor impedance matching is used to enhance low end performance, the reflex speakers port. Something causes our perception to say there is more bass. But what does our perception rely on? I´ll come back to this a little further on. However, looking in the frequency domain, at the response in level from bass to treble there is a hint of a reply in some cases, in others not. What I am referring to is the temptation to design the reflex mechanism so that it creates a rise just before the low end roll-off. This does create a feeling of deeper bass, but its not. The reflex speaker designer uses the open ended tube to create a resonance at a fundamental frequency where the speaker would begin to roll off. The source of this enhancement comes from the energy inside the cabinet, from the backside of the driver. Thus it is in antiphase to what happens at the front. 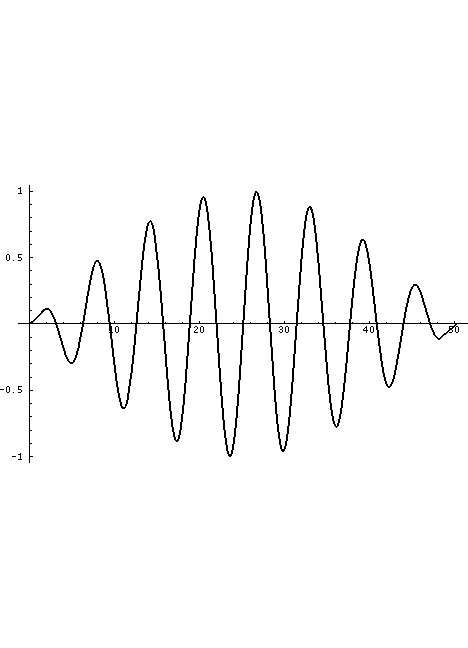 In other words, the sound is delayed half a cycle at the frequency where the resonance is defined. In an open ended tube,as shown in figure above, is often used in bass-reflex speakers. 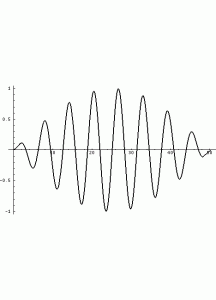 The first resonance occurs at half the wavelength. At every new wavelength, multiple of the fundamental (harmonic) another resonance occurs, so the reflex tube does not only emit sound pressure at one single frequency but at many. So if our reflex speaker designer uses a tube that resonates at 30Hz it will also produce sound at 60, 90, 120Hz, etc.., if those frequencies are produced by the driver unit. As you can see from the figure, the mouth of the tube is the place where the pressure is at minima and the rate of change is at maxima. This is the high impedance point. Closer investigation of the tube will reveal that the length of the tube does not exactly match the underlying mathematics. The reason for this is that as energy is put into one end and for it to return to add to the pressure inside the tube it must be reflected back in some way. Just as an Olympic swimmer reaches the end of the first lap and hits the far end of the pool, a turning is required. In a reflection this means the phase is inverted such that the returning reflection is now in-phase with what is going on inside the tube. The mechanism for reflection is the large impedance step occurring the moment the air exits the tube and finds itself in open air. Exactly where this occurs depends on the diameter of the resonant tube and into what space it radiates. So, we know from this that what is giving the enhanced bass is slightly delayed. We cant see this in the frequency response because it only shows what is going on in the frequency domain, not the time domain. The time domain is like a third axis, imagine it being the dimension that goes from the paper/screen to your eyes. 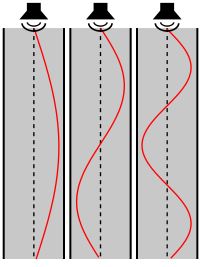 The time domain gives us information about the duration of a single frequency. How about our perception then? We know that our perception of loudness (SPL-sound pressure level) is defined as volume per time unit. In plain language as liters per second of air. The first thing about this is that indeed is our perception of loudness connected to the time axis. You could say that our perception of bass is for how long time we are exposed to it, not just the momentary level. Air at normal room temperature has mass. It weighs around 1,2kg´s per cubic meter. Thus the air in the resonant tube will have, a not insignificant, mass. This mass takes time to accelerate into a full blown resonance and once the signal from the driver is gone it will keep on resonating in a decaying fashion. What you see in the figure above is exactly this, at the initial onset of a transient in the bass, nothing happens. If the signal is more continuous the reflex port will gradually begin to contribute to what the driver units front side is doing. Once the driver stops nothing happens and then a gradual decay will follow. From a perception (and energy) point of view, measured over a window of time, more has happened. But is it part of the original musical signal? I´ll let you answer that one. This now fully explains what is NOT present in the horn but in the bass reflex speaker. There is even a term for it, “hangover”. So, next time you get to listen to a horn and a bass reflex speaker using the same material, compare carefully. One conclusion can be made. Bass reflex speakers create a type of trans-domain distortion at the fundamental and its harmonics. What you gain in quantity you lose in quality. Another conclusion is that looking at the frequency plot from manufacturer X tells us very little about the speaker unless you also study the time plot. This now becomes rather complex why the best advice is to listen. Footnote; well designed reflex speakers can apply moderate amounts of resonance and get good sounding results. The smaller the volume in the resonant cavity the less of an issue as it is the mass of air that is the problem. Thus, the problem grows with speaker size. How the room influences reproduction of audio is constantly present for anyone involved in the audio profession. This awareness concerns reflections, nodes and reverberation time. Recently I visited a client trying out Earos at home, “there is no bass” he said. True enough, at the listening position the low end was not present. This situation occurs in all rooms and at all frequencies, the things is that as frequency falls wavelengths become longer and the space where these nulls exist are more prominent. With higher frequencies and decent acoustics both direct and reflected sound is more uniformly distributed and the nulls are not a noticed. The cure is not primarily to fork out for a room correction device but to actually rearrange location of speakers and listening position. There is no one single speaker in the world that can be brought to perform it´s best unless it is given a fair opportunity by proper room acoustics. Room correction devices used may in fact make matters worse in one area whilst attempting to correct in another. For instance in our case of no bottom end, the room correction device would attempt to raise the low end. What now happens is that your speaker may be forced to operate out of its linear range increasing distortion and reducing headroom for transients. One thing room correction cannot do is alter the reverberation time. The way all frequencies decay over time is a characteristic footprint of the rooms tonality. Within the high end audio world there is in my opinion far too little attention on room issues, perhaps as it is held in some obscurity about how it works and what to do. The good news is that this is a well researched science why there are both services and tools available to cure most issues. Fixing room acoustics is going to the root of the issue whilst digital room correction deals with the symptom. But what about the other side, the side where music is brought to life, how has acoustics shaped the art? This subject then takes us back to our own place of musical worship. If music was made for a particular acoustic environment then how shall my listening rooms properties be to justify the musical content? For sure, you don’t want a room that alters the tonality in any way. The room should be neutral so that the acoustics of the recording can be conveyed without unknown additions. A flat frequency response is not all, reverberation time across audio spectrum is important too as is how sound is dispersed in the room. Keep in mind when you spend all that money on esoteric devices that you may in fact be missing the most effective investment you can make by tuning your room acoustics. As a speaker manufacturer it is part of our overall mission and also passion to bring good sound to you, we do have control over what the speaker does but not the room. I have returned from Los Angeles and the 2011 T.H.E show in Newport Beach and also survived the less amusing return trip to Stockholm. Jetlag, I found after years of feigning pills of all kinds, was made nonexistent by small dose of Melatonin before bedtime upon return. Sitting in my retreat cottage in Lapland, overlooking a mirror calm lake with occasional arctic char or trout fetching an insect in mid air, I feel the mood is the right for some philosophical contemplation on recent events with Earo. We are continuing along the path to make the launch in the US and our partner in this vast country, Atenga Inc. with its subsidiary Earo-US are doing a great job not only in establishing a presence but also standing solid in their conviction to take on the cumbersome work to create brand awareness from scratch. T.H.E in Las Vegas was by no standards poor for Earo, on the contrary, but the Los Angeles event was so much more, greater number of exhibitors and more real endusers as visitors. The venue, The Hilton, proved to have rooms with less acoustic issues than what is usual, only a slight bottom end boom at the preferred listening position did not mask the characteristics that we wished to convey. The setup was as before, files played from Apple laptop running Itunes to an audiophile DAC whose balanced audio was fed straight to the two pairs of Earo Eight and TheUlf respectively. The W4S DAC features a remote volume control exactly where you want it in the chain. We got several comments on how simple it was to get high-end sound and a great many visitors where clear about the diverging trends, one part of the industry will retain a motive force with passionately engineered and presented devices for the buyer to experiment with. The other path, the short one to high end and high definition music experience, is the one that will be entirely digital and “filebased” all the way to the last mile, the transducer. Or, loudspeaker as we prefer calling it. Our three days of public reception were just wonderful. Per and myself did not have our wifes with us this time why we had less opportunity to leave the room to rummage the venue, we were busy playing music and discussing most of the time available. We tried to play as varied music as possible and to respect the visitors need to manage time so it was a medley of Classic, Jazz, Blues plus some softer Rock. All mixed to present as much of the characteristics by throwing as many difficult passages as we could at the speakers. We did miss out on having heavier Rock as we did get some requests for this. I hurried downstairs and searched the audiophile record sales but it appears good recorded Rock is difficult to find…At the end of the day, female vocals do very quickly reveal what it is all about and we played a lot of this. Here it´s important to present a medley so that a particular recordings tonality is not perceived to be the one of the speakers. One distributor that spoke with my colleague said “there are five speaker brands on the show that are of interest and yours is one of them”. Being in some pretty amazing company, this hit home well. Summing it up, the overall and lingering emotion is that of great enjoyment meeting all these fantastic individuals and to listen to their music (we are open to BYO always) and share the passion for the art. Profound thanks to you for making this such a great event. Rane, in fact, has a lot of good, serious material on their site. We frequently get the question why our speakers are active and why we are not using a triode amplifier. Valid question as horns are efficient requiring low average power. From this standpoint tubes would do fine. Certainly this was tried during the design phase of the Earo Eight. in fact we tried out a lot of different amplifiers types. We did blind A-B tests between silicon and tube classes. Our own tube amps is a pair of modernised Quad II´s. We could easily drive them to 95+dB levels at the listening position with the 12watts or so delivered from this Class A output. Because the Earo designs offer such high degree of detail in the reproduction, asessing performance of the entire playback chain is revealing. We found that the audiophile D-Class designs used in all Earo speakers gave an overall better result. One explanation for this is that tubes are high impedance devices and loudspeaker drivers are low impedance why the fundamental mismatch requires an electrical transformer. Unfortunately this transformer does not offer the milli-ohm range output impedance that D-Class can do. Low source impedance is particularly important to optimize the driver performance for horns. Another added benefit is that whilst D-Class can produce amazing low THD figures and being independent over the frequency range, they tend to be particularly low in THD in a power range around 1/10 of rated power. Exactly where Earo speakers takes out its average power. This also adds the beneficial consequence of having a large power margin giving flawless impulse response capability. With the last of the two HighEnd shows packed up and back at the office we can note some truly wonderful and warming response from our visitors. It is not just what was said, it was how it was said and the time we hade the fortune of having all those visitors in our rooms. You even came back for more! Heartfelt and profound thanks to our visitors and supporters! No, I am not going to talk about the usual response I get from wife, daughter and son when I can´t help myself and sing along to a catching piece. But there is a common denominator here with what this entry is about. Been to a hifi shop lately? See any speakers there? Ok, lots, I thought so. A fair share of all speakers on the market employ some form of reflex function to enhance the bottom end. This function is a so called Helmholtz resonator. A cavity, open in one or both ends will resonate at a fundamental frequency plus its harmonics , related to the volume of air in this cavity. Air has mass, approximately 1,2kg´s per cubic meter. Not insignificant. After the onset of the first tone, transient etc. the resononant cavity will at first resist to change its state, then it will gradually follow. Once the tone disappears the air in the cavity is now mass in motion and will resist stopping, gradually decaying as acoustic energy (kinetic energy in air molecules) is converted to heat. Back to the hifi shop, in this environment you listen to a creation of your liking, but would you believe this is the worst possible place to do it in? Why is this so? As the target speakers play out the remaining sets of speakers will wake up and their reflex ports and speaker drivers will come alive. What happens is that you may get either an increase or decrease in the rooms acoustics that will color the listening experience severely. It will also impair the rooms response to impulses. One pair plays and all the others sing along. There is a bit of a buzz out there surrounding directional or omnidirectional loudspeakers. Which are best? The reply is neither. But, why? In Earo´s white paper “nearly a complete case for the horn”, it is explained why audio reproduction can never be more than an illusion of a reality. Even so, a very good and satisfying illusion at times. So then, we could conclude that us audiophiles strive to maximize satisfaction. Just like watching a movie, eating a skillfully prepared meal, visiting a gallery or just watching a star speckled night sky. A sensory tickling. Already as early as in mid 1970´s Earo worked on omni-directional designs and even sold a few of them. Omni-directional horns are rare but not new, more than 60 years ago Michelson designed a backloaded, single driver horn employing a diffuser for omni-directionality. Earo ´s work on speakers began with omni-directional single driver horns more than two years ago and a release is planned for later part of 2011. But let me just establish where we stand here. Omni-directional speakers, regardless of type of design can not be more accurate than a directional loudspeaker. Omni-directionality implies that energy is projected in all spatial directions in the room. This will excite nodes more than a directional speaker would (with exception of dipoles) and increase the influence of room reflections that add and contribute to the perception. This will happen in a relatively larger extent than when using directional speakers. Since it is all an illusion, it is neither good nor bad. Omni-directionality will make use of the listening rooms acoustic properties to a significantly larger degree than a directional one will. This puts a lot of the success in the hands of the owner of the room in question. This does not make matters easier, instead it complicates them. As for our hearing mechanism, the absolutely most significant part is the arrival of the auditory clues in the first and direct sound. Both types of speakers can fulfill this criteria if designed and set up properly. What happens next is more a matter of taste, does the coloring of the room acoustics please you or is the opportunity to enjoy reproduction in more places in the room important? In physics, it is commonplace to accept a fact (based on Heisenbergs uncertainty principle) you measure with increased resolution in one domain you lose the ability to do so in another. Similar things go on here, the tradeoff is for increased spatial distribution, accuracy becomes less. The point is, there is no free lunch. You want a broad image in the room? Ok, but you lose the accuracy of the sweet spot. I have seen marketing material that go at length to argue the superior musicality of omni-directional loudspeakers. How can one argue taste I wonder? Some even claim this principle to be the only correct one for reproduction. No one at Earo would ever make such claims as we don’t believe this can be true. We do believe that an omni-directional speaker system, designed under the same principles as we base all our products on, can give an outstanding musical experience. That´s it, an experience. Never will we claim that omni-directional speakers more accurately reproduce what the recording and mastering engineers heard as long as they use directional speakers for mastering. In principle all recorded material is mastered using both near and farfield directional loudspeakers. A recording engineer, with some level of sanity, would not let the room influence this process. Earo designs and manufactures exclusive high definition speakers. We build to order why you get a personal and unique product, as unique as the listening experience. Copyright © 2019 earo 2011. All rights reserved.